In the latest report in its “The State of Freight” infrastructure series, U.S. member ports of the American Association of Port Authorities (AAPA) – the unified and recognized voice of America’s seaports – identified nearly $4 billion in crucial port and supply chain security needs over the next 10 years. That funding level is what’s needed to maintain and upgrade America’s port facilities and ensure they are properly equipped to address new and evolving security challenges. 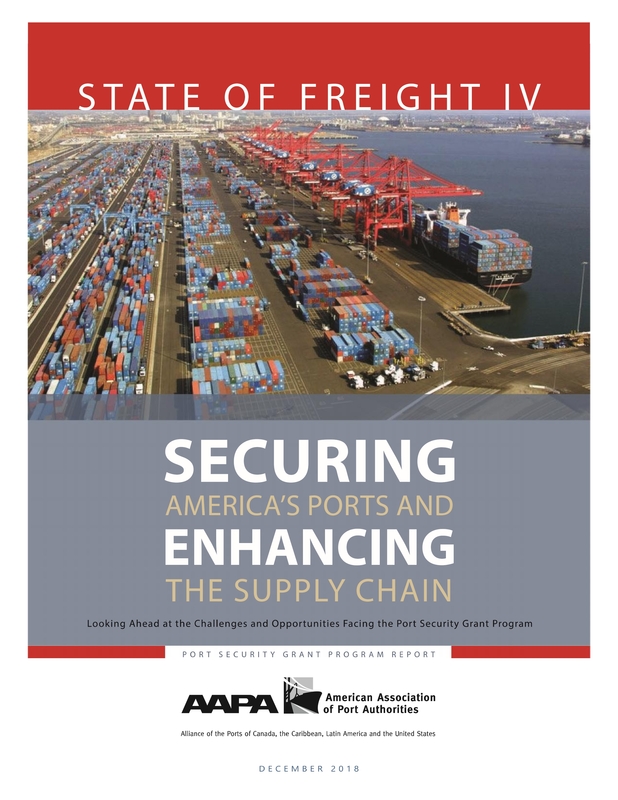 “The State of Freight IV” is the fourth report in as many years, conducted by AAPA, to highlight the needs of America’s deep-draft commercial public ports to effectively move goods into and out of their facilities by land and water. This latest report recommends refocusing the Federal Emergency Management Agency’s Port Security Grant Program (PSGP) to better meet the security infrastructure needs of publicly-owned commercial seaports and related maritime operations. This includes funding an estimated $2.62 billion in maintenance and upgrades to port security equipment and systems, and another $1.27 billion for investments to tackle cybersecurity, active shooter, drone mitigation, resiliency and other evolving security threats. Currently, the U.S. government invests $100 million annually in the PSGP to protect resources that account for more than a quarter of the American economy, which is the annual value of cargo and passenger activities attributed to our nation’s ports. While the return on investment is impressive, security challenges at ports keep changing. Since the grant program was initially authorized after 9/11, America’s population has increased about 15 percent, with a pronounced population shift to metropolitan areas, and in many cases near port authority freight and passenger facilities. By the end of 2017, container volumes through these facilities had increased 71 percent and total foreign trade tonnage had increased 37 percent, while cruise passenger traffic nearly doubled. AAPA President and CEO Kurt Nagle remarked: “In The State of Freight IV, we took a deep-dive to better understand the future security challenges of U.S. ports, the communities that surround them and the supply chains that serve them. Not only did we find that Port Security Grant Program appropriations need to increase four-fold to $400 million a year, but the ratio of grant funds going to ports needs to at least double to 50 percent to properly mitigate for security threats. “Protecting our nation’s seaports against terrorism and other security threats helps ensure safe and reliable goods movement, which is critical to our economy. However, in recent years, nearly two-thirds of Port Security Grant Program funding has been spent on training and equipping first responders, and on improving response capabilities. What’s needed now is a shift to more investments in maritime domain awareness, including prevention and protection measures.